As our world becomes darkened with increasing political absurdity and polarization, a beacon of hope shines from the Bay Area Derby headquarters to tell us that there is a Resistance and that it stands united. As they take to the streets to spray paint their DIY scrimmage jerseys, members of the Berkeley Resistance answer almost in unison: the most important element of their 2018 season will be togetherness. They are sticking together, not only in team-building crafting days, but also on the track with a focus on learning to communicate and support each other, socially and physically. Their togetherness becomes even more literal where the blockers are concerned. They are focusing on “getting full body on each other” according to team captain JJ “Jerk Jar” Wrecks (#12), as well as “trying new things outside of traditional Bay Area flat wall”. 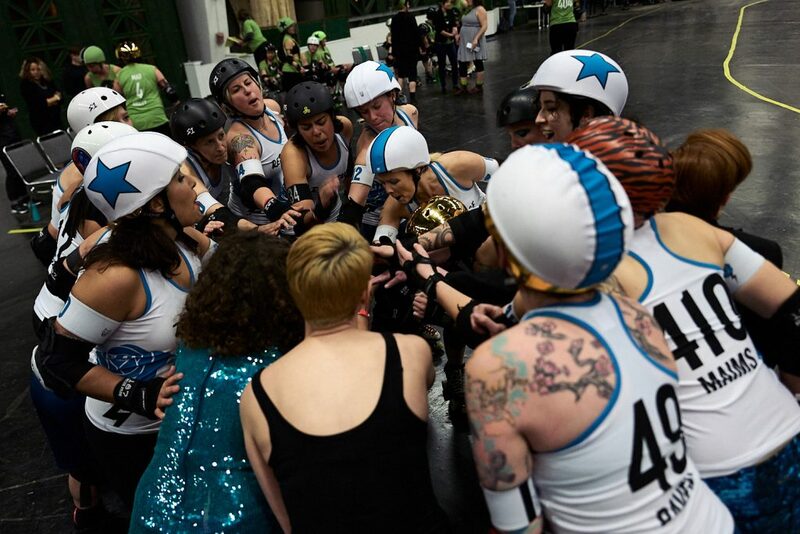 Other new aspects of the Berkeley team include coach Smother Mary (#313)–who promises to “teach you to be young again,” having risen meteorically out of the Reckless Rollers program and onto the Travel Team and Berkeley captainship as a jammer–along with fellow Berkeley jammers Xpress Lane Jane (#212), Frightmare (#31) and Eva Menace (#20). But Smother Mary isn’t the only new thing to come to the Resistance this year. 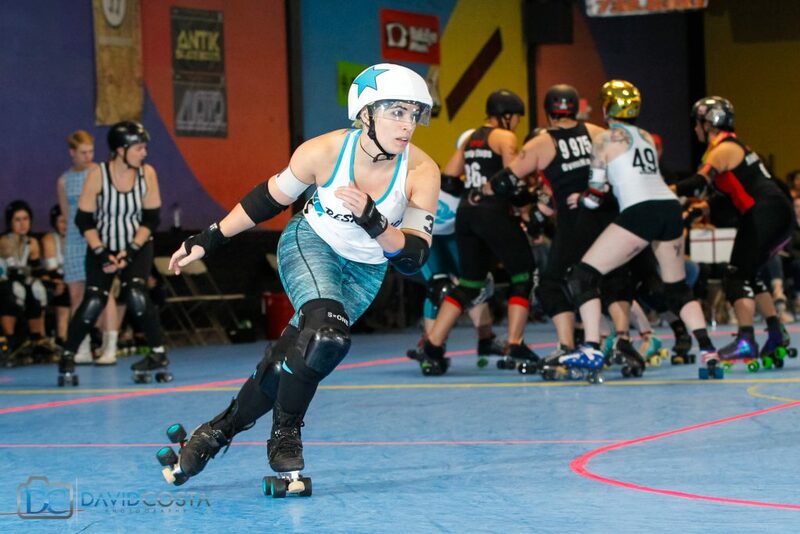 In fact every skater currently on the roster, with the exception of one Shenghis Khan (#434), skated with different home teams during the previous season. Their team color even reflects this year’s blank slate — the teal color scheme has never previously been seen for Berkeley. The Resistance’s new logo also represents new growth: a rose on a lightning bolt echoes the team’s “pretty but gritty” aesthetic and evokes the old activist proverb: “they tried to bury us. They didn’t know we were seeds”. Taking on the challenge of “creating a cohesive team with players coming from a variety of backgrounds,” as Smother Mary puts it, the Resistance intends to grow, like a bramble of roses: strong and inseparable. The Berkeley Resistance have hit the ground skating. 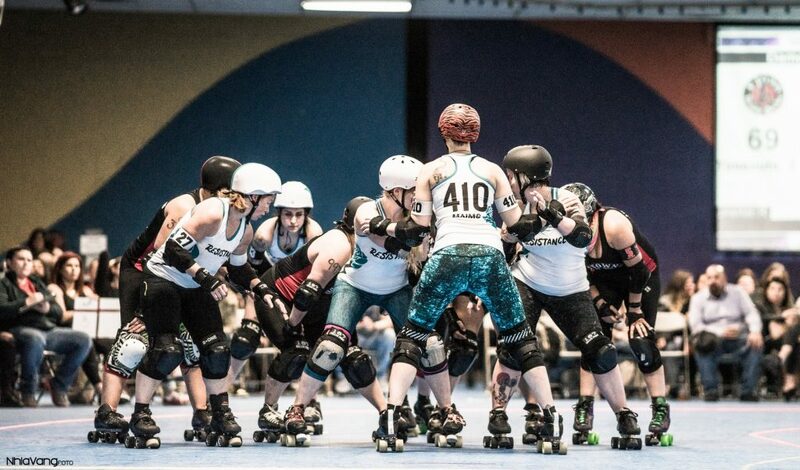 In February, they defeating Visalia Roller Derby’s V-Town Derby Dames and in March narrowly lost in Seattle to Rat City Roller Derby’s Derby Liberation Front. For the BAD Season Opener, they were defeated by SF ShEvil Dead. 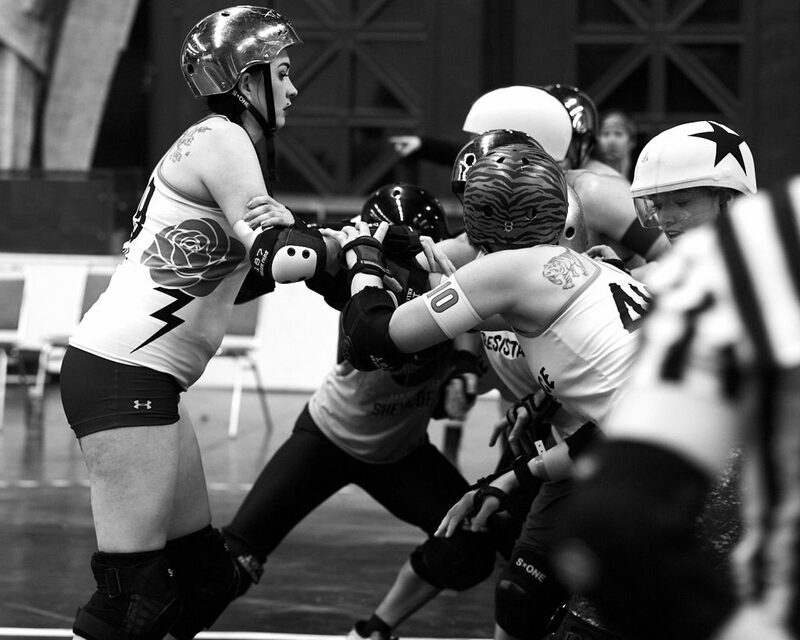 They look to #bringtheresistance to Saturday’s bout when they take on the Oakland Outlaws in BAD’s second home team game of the season.